Norfolk based care provider, Caremark (Norwich) were celebrating last week with their Care Manager, Julia Andrew scooping an award at the first ever, Norfolk Care Awards. Norman Lamb, Minister of State for Care & Support at the Department of Health and Liberal MP for North Norfolk attended the evening lending his support to this new innovation. Caremark (Norwich) were up against stiff competition from 100 other nominations which saw them finish in the top three, before taking the runner's up position of Highly Commended for the Motivational Leadership Award. Julia Andrew, Care Manager with Caremark (Norwich) was thrilled to achieve this and said "It is always a privilege to be nominated but at the end of the day, it's always down to the entire team and the hard work everyone has put in over the last while. I was thrilled to get to the top three and then to be awarded Highly Commended in my category has been fantastic. It makes all the effort worthwhile." The special black tie event was held at the luxurious Dunstan Hall in Norwich on Thursday 13th February. Supported by Harold Bodmer,- Director of Community Services, Dennis Bacon - Chair of Norfolk Independent Care and Willie Cruickshank - Director of Norfolk and Suffolk Dementia Alliance and hosted by well-known and popular TV personality and journalist Helen Lederer, this new event was well attended by care companies across the county. More than 250 guests gathered to celebrate excellence throughout the Care industry across 9 different categories, enjoying a gourmet dinner before the awards presentation by Helen Lederer. Commenting on the event, Harold Bodmer, Director of Community Services said "Norfolk offers a wide range of high quality care and support services across the county. This doesn't happen without extraordinary commitment from many individuals engaged in care work. 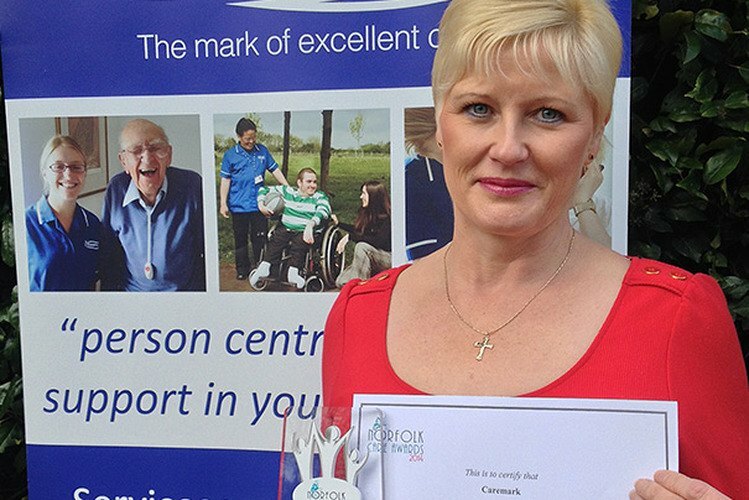 The Norfolk Care Awards will help us to acknowledge and celebrate this." Caremark (Norwich) provide care and support for people of all ages, ethnicities and abilities, enabling them to live safely and independently at home but who may require support to do so. The Norwich based provider has built a solid reputation for providing quality home care and support over the last 5 years, with this recent accolade serving to reinforce its commitment to quality and service to the county's vulnerable individuals.